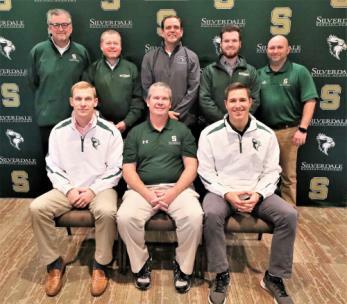 Jon Massey, seated center, is the new baseball coach at Silverdale Baptist Academy and eagerly awaits the start of the 2019 season. Massey used about an hour Tuesday talking baseball and introducing high school and middle school coaches. Flanking Massey, are varsity assistants Kevin Burke, left, and Taylor Hasty. Back row, Tim Thompson, Tim Daniell (head middle school coach), Rod Bolton, Collin Daniell and Gary Meadows. Over the last few days, Chattanooga has been dealing with a brutally cold weather system that struck like a frigid shockwave from the northwest. Throw in yet several more rounds of rain nearing the cusp of sleet or snow and high school basketball teams heading down the backstretch of the 2018-19 regular season and it made Tuesday an odd time for baseball talk. Yet, Jon Massey, the longtime prep coach who left a stunningly successful softball job at Ooltewah to start anew as the new diamond coach at Silverdale Baptist Academy, did just that. Massey, who spent the previous 17 years at Ooltewah serving as coach for the freshman football and baseball teams and five years as the head guy of a highly successful softball program, scheduled a “press briefing” about his new assignment with the Seahawks to talk baseball and introduce his high school and middle school coaching lineup. “This is a fresh start,” said Massey, who went 180-46 with three state softball tournament appearances that included a third-place finish in 2015. “I enjoyed those years at Ooltewah and had a blast coaching softball. I’m having a blast at Silverdale too. Massey used the nearly hour-long session to introduce his high school assistants – Taylor Hasty (he’s also the athletic director), Rod Bolton and Kevin Burke. The middle school staff includes head coach Tim Daniell, Gary Meadows and Collin Daniell, Tim’s son who was a freshman on Silverdale’s 2013 team that finished runner-up to Friendship Christian in the TSSAA Class A state tournament, and Tim Thompson, SBA’s middle school athletic director. Bolton should be a familiar name to anyone in local baseball circles. The former Ooltewah standout was drafted by the Chicago White Sox in the 1993 summer draft and signed a contract the next day. He spent part of the 1993 and 1995 seasons in the big leagues and eight of his 10 minor league seasons in Triple A where he was 75-52. Bolton was 113-83 over his entire 12-year professional baseball career. His best year was with Nashville in 1993, going 10-1 with a 2.88 ERA. Bolton, who has two daughters enrolled at SBA, spent the last two years working with the middle school baseballers. The Seahawks have done 118-54 dating to the highly successful 2013 season with only one losing campaign (12-15 in 2015). There are three 20-plus win seasons, including the last two, in the SBA b baseball resume. Tim Daniell has been around Silverdale for years and likes the idea of Massey combining the high school and middle schools in terms of baseball instruction and philosophy. Daniell did not coach baseball during Tim’s playing days and fondly recalls the “special” 2013 season when Friendship Christian posted a 4-0 win for the state title at Middle Tennessee State University. Reid Clements, Spencer Mossburg, Joey Szollosi and Colton Rogers were the top four pitchers on that memorable staff in 2013. Massey is cognizant of the relationship between having talent and winning big. Back-to-back 40-win seasons and a five-year mark of 53-11 in District 5-3A softball, don’t just happen. It takes talent and Massey was blessed with a ton of it throughout his five-year tenure with the Lady Owls. It’s clearly hard for Thompson to restrain his enthusiasm for what’s going on with the baseballers. There is, however, a smidge of reality to Thompson’s gung-ho attitude. There is a point on the athletic calendar that Massey eagerly awaits. It’s Feb. 11. It’s around that time when Massey will get eight baseball players from the basketball team and start whipping them into shape for diamond play. “When you’ve got 20 kids and eight of them play basketball, you have to have patience for them to finish with basketball,” he said. “I’m not sure when the region tournaments start, but we need those guys with the baseball team as soon as possible. Silverdale’s opening baseball game is March 11 at Grace at 6 p.m. The teams will play again on March 12 at the same time. Yep, Silverdale’s ballfield now has lights and night games, especially postseason contests, will be a welcome addition to the baseball program. “We’re going to play as many games as we can and teach them the fundamentals of baseball,” Massey said. “For the most part, we’re going to teach the middle school guys just like the high school kids. A few things will be different, but the philosophy is going to be the same. We’ll expect the middle school players to know the ropes when they get to high school. Taylor, Kevin and I are going to be teaching seeing the ball and hitting it hard. We have a small field and for the guys that have power, if they can launch a few balls, that’s great. I think we can hit a lot of doubles and home runs.